The Atlanta area is a gorgeous one boasting some of the most beautiful, historic homes in the state of Georgia. But like most old homes in regions with warm climate, the threat of mold is a real concern. If you think you might have a mold problem in your home you should call a local certified mold removal expert that offers a free inspection. Furthermore, homeowners should be informed regarding the signs of a mold problem, and the dangers mold poses. If I Can’t See Mold Does that mean my Home is Safe? Not all mold problems can be seen by the naked eye. Mold spores thrive in moist, warm areas that get little sunlight, and the old homes of Atlanta with common pipe leak problems and humid weather create a perfect Eden for mold to spread. But in the beginning the spores are microscopic. As they populate they expand and take on the semblance of black spots. These spots can form in any room of the home but are most commonly discovered in bathrooms between tiles, or in the kitchen—two rooms where moisture levels are always higher. If My Pipes are Leaking Does that mean I have Mold? Leaking pipes certainly cause mold growth, but there is no way to be sure of a mold problem until you have a professional come out and test your home and the air inside your home for mold spores. If your pipes are leaking you will want to call a plumbing service that is certified and licensed to address water damage restoration and water cleanup services, as a leaking pipe will not only cause mold but also wood rot and it has the potential to flood your home. Large amounts of moisture are almost always common in areas where there is a pipe leak, so by having a water damage team correct the pipes, you will be lowering your risk of having a mold problem. What Are the Risks Associated with Household Mold? Aside from lowering the resale value of your home, household mold can cause a plethora of human illnesses, including death. In fact ‘Clueless’ actress Brittany Murphy and her husband died from a mold problem located in the couple’s bedroom. According to The Centers for Disease Control and Prevention’s Summary of 2004’s institute of Medicine Report, mold can cause respiratory problems, asthma and lung diseases. Some symptoms to mold exposure include shortness of breath, flu-like symptoms, itchy eyes, runny nose, wheezing, coughing, headaches and skin irritations. Elderly people, children and individuals with immune system and existing respiratory problems are especially vulnerable. Even the health of your pets is at risk! The Centers for Disease Control and Prevention warns that people exposed to mold suffering from these symptoms should report to their general doctor immediately. Never try to remove the mold on your own. 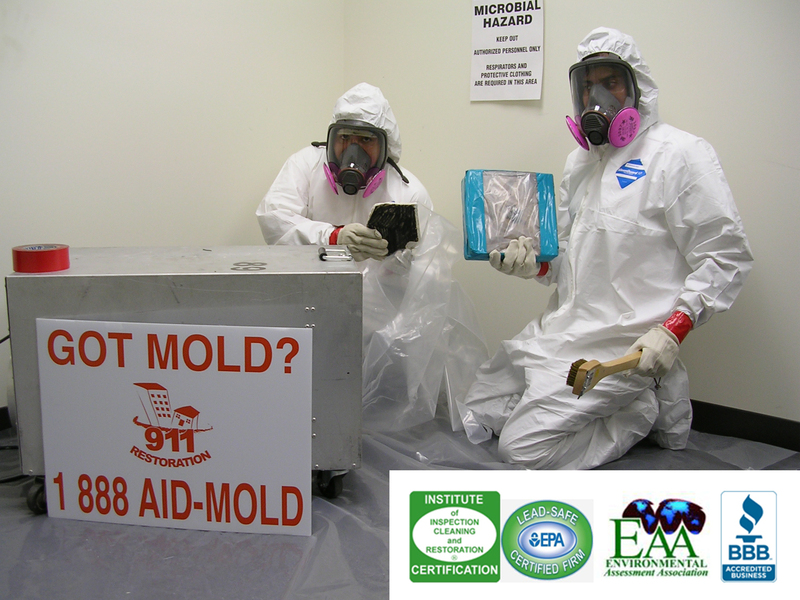 It takes a certified professional with industry strength equipment and special training to remove all mold leaving the home testing at safe levels. Your home is your castle, and your family members are its most sacred treasures. Let the pros handle the stress for you.